The Internet can be a magical place. It’s a platform where we can post favorite pictures, important updates, memorable moments, and so much more. It is also a great way to communicate with others. Some celebrities use it to flirt with other stars and it can be oh so adorable when they do. When rumors began to circulate that Priyanka Chopra and Nick Jonas were dating, they didn’t do anything to hide from the thousands of people across the globe who were looking for definitive proof. 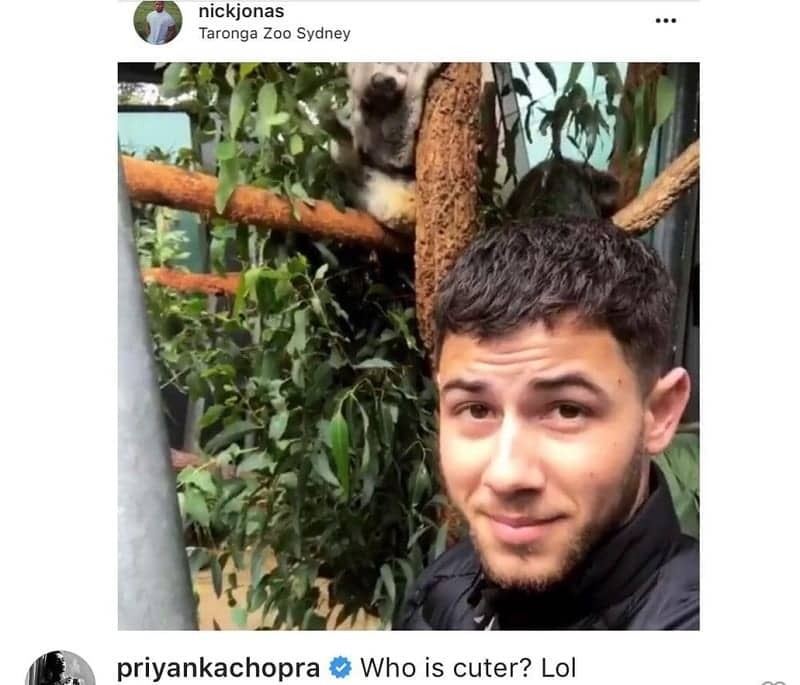 In fact, they slid into each other’s Instagram comments – and we particularly love the adorable selfie that Nick took at Taronga Zoo in Sydney. Priyanka just knew that she had to comment, and this is what she came up with. This flirtation made us ask a very important question: Who IS cuter? We can’t decide. Are they secretly dating? Are they just friends? Are they gonna be the new Ross and Rachel? Well, it seems as though we might never know because these two are keeping quiet about their relationship. Yet, it’s fair to say that they sure do act like a couple on social media. 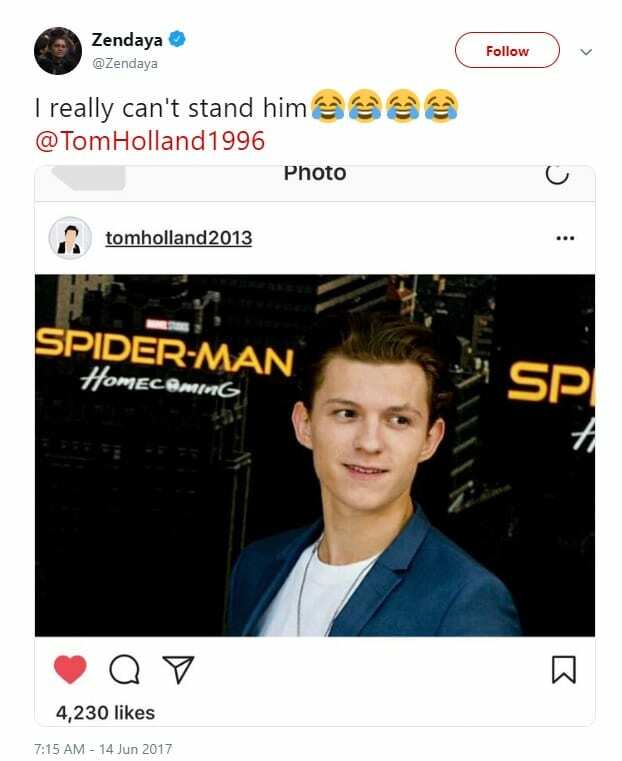 The Spider-Man co-stars have been very active on Twitter and Instagram, and have been fighting like an old married couple. Zendaya is obviously going for the “treat ‘em mean, keep ‘em keen” approach to flirt with Tom. 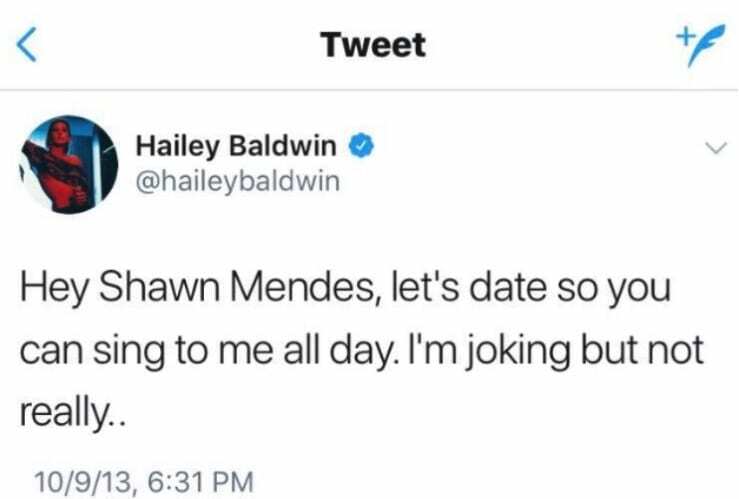 Hailey Baldwin spoke for the whole human race when she posted this tweet in 2013 because we all wish that Shawn Mendes would sing to us all day. 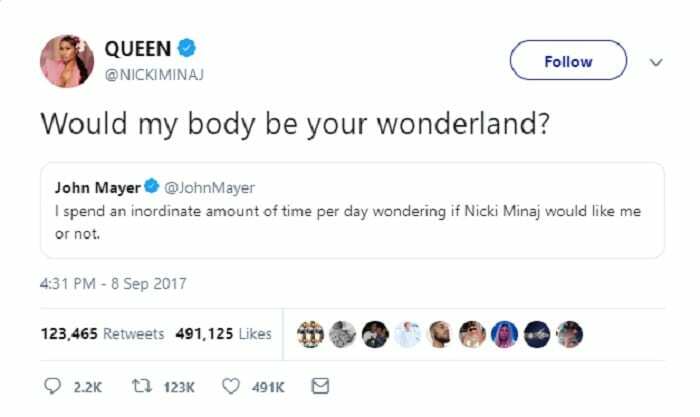 We love an online flirtation as much as we love a good pun, and John Mayer and Nicki Minaj totally nailed this one. While fans had never quite put these two together, as soon as this Tweet made its way into the world we were already naming their children. After Nicki spotted one of John’s random-as-ever tweets, she just knew that she had to reply. Thankfully, she didn’t let the comedy police down with her reply. What’s even more incredible is that John was just as shook as we were with her response. Bella Thorne really isn’t shy when she has her eye on someone, and she’ll happily let the whole world know just how she feels. 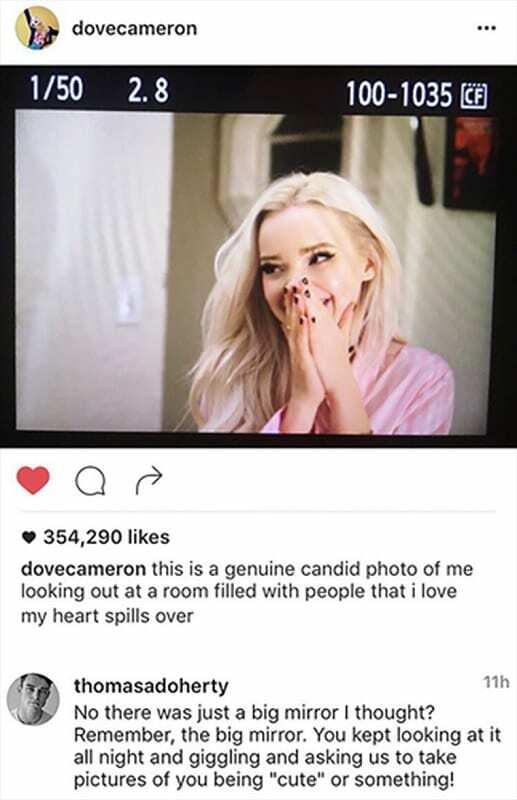 Because of this, she just couldn’t contain herself when she saw a picture of Dove Cameron. She needed to reach out, and ideally, she needed to marry her. Of course, marriage doesn’t really work like that – but Dove was willing to give it a go if Bella got down on one knee. Although this never happened, we’re still holding out hope that one day it might. Ariana Grande and Mac Miller’s love story is a tragic one, but thankfully we will always have the internet to remember the many ups they had, rather than the downs. Before these two started dating, they worked together, but before they worked together, they were Twitter flirters! 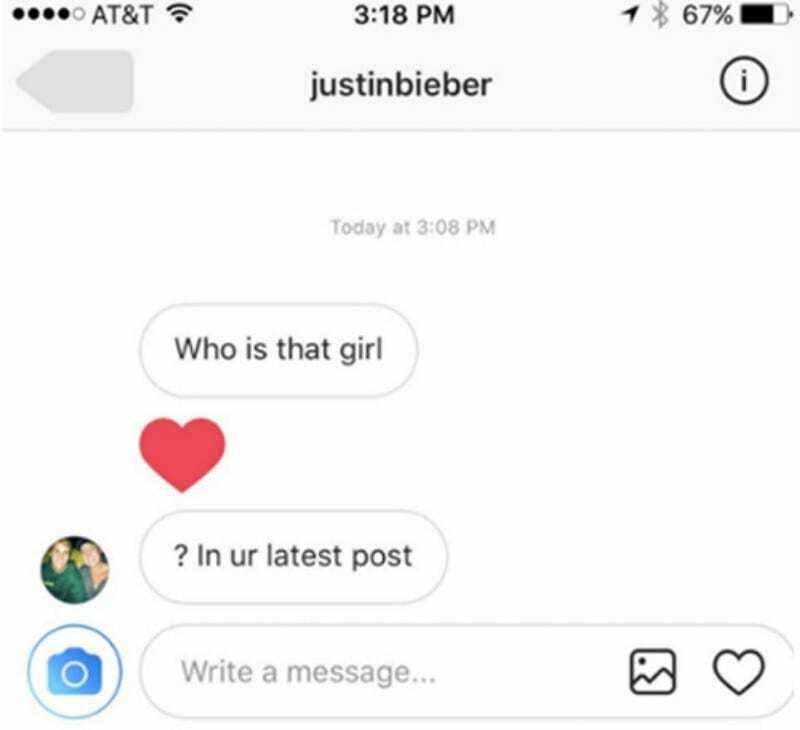 Mac made no secret of the fact that he had a crush on the singing superstar, and he decided to use a made-up name (Larry), to slide into her DMs. Their love blossomed from there before things took a devastating turn. If you’re a fan of the Deadpool franchise, then you might remember Ryan Reynolds roping David Beckham in to one of the promotions for Deadpool 2. Well, the two seem to have formed quite the friendship from the experience, so much so that they even get a little flirty despite both of them being married. 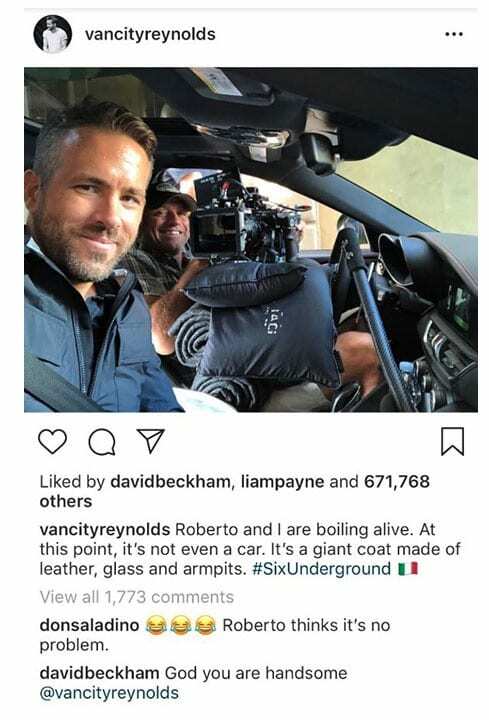 On this Instagram post, Beckham felt the need to tell Reynolds just how handsome he finds the other man. Honestly, who doesn’t love a good bromance? Well, Anne’s response had everyone feeling the love, when she expressed how nervous she had been around Mandy’s star power. She also wrote, “So happy for all that you have going on! Let’s get together and throw ice cream at each other soon.” Good news is Mandy is definitely on board for that reunion! Ok, this is probably more admiration than flirting, but it’s just so sweet and unexpected. In an interview about how she had transformed her look for the movie Molly’s Game, actress Jessica Chastain shared that she learned some beauty tips from Kim Kardashian, and expressed admiration for the reality star. Kim was touched by the interview, and shared it on Twitter with kisses and heart emojis. Jessica then responded by letting everyone know it was Kim who made the transformation possible. When these two super star singers met there seems to have been an instant connection. 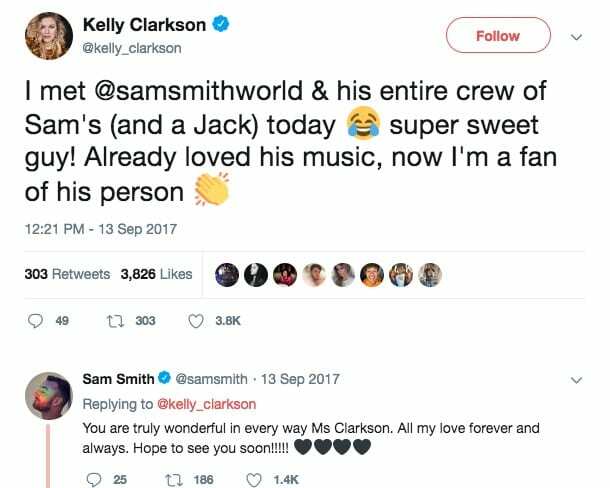 Kelly Clarkson quickly took to Twitter to let the world know how much she adores Sam Smith, to which Sam Smith quickly responded by telling Kelly just how wonderful he finds her to be as well. It was just too sweet, but it got even better when Kelly replied that they should definitely sing together some time, and maybe next time they’re together they’ll make it happen. 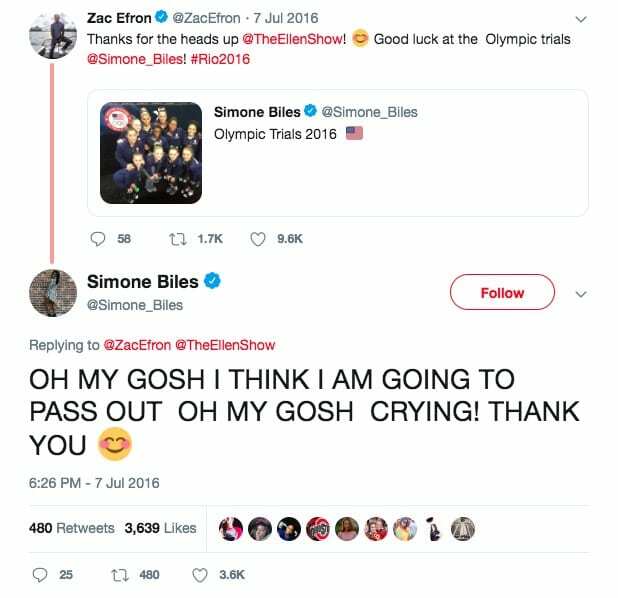 In 2016, right before the Rio Olympics kicked off, the world was treated to the adorable exchange before Zac Efron and Olympic gymnast, Simone Biles. It all began when the actor wished Simone good luck on the Olympic trials, to which she responded like any excited fan would. The exchanges continued, and it turned out that Simone was a massive Zac Efron fan. So, it was only fitting that after winning her fourth gold she got to finally meet him in person, and earned herself a hug and kiss on the cheek. The super star singers Sia and Katy Perry have never shied away from the fact that they love and admire each other, and they’ve even gushed over each other’s talent in the past. But sometimes all it takes is a short and simple message to get the point across. 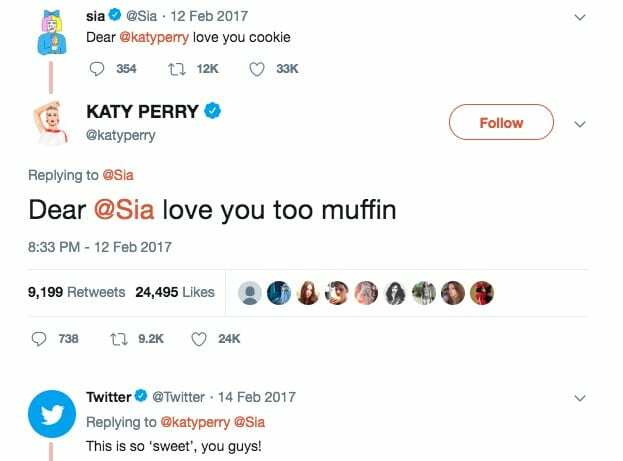 These two tweeted each some short and sweet messages saying “love you cookie,” and “love you too, muffin.” Even Twitter itself couldn’t get over the sweetness and got in on the love. You may not know it, but these two ladies happen to be really close friends. 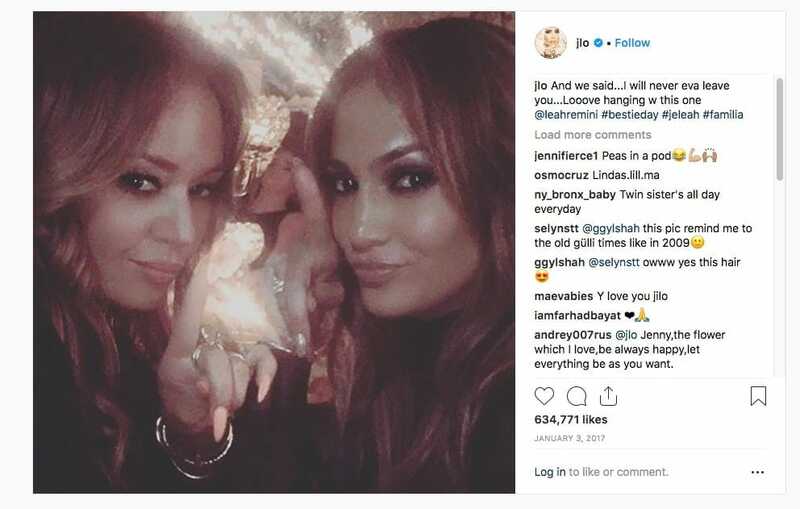 Jennifer Lopez has taken to Instagram to share the love she has with her bestie, Leah Remini, and while it may not be flirting per se, it definitely gives us a vibe of #FriendshipGoals. You can practically feel the love coming off the post, and Leah has plenty of her own out there as well. It’s one of those friendship for the ages. This might seem like a bit of an odd couple to some, but it turns out that Mariah Carey is a huge fan of Will Ferrell, and she has taken to Instagram to share it. This is yet another case of best friends taking to social media and making our hearts full. 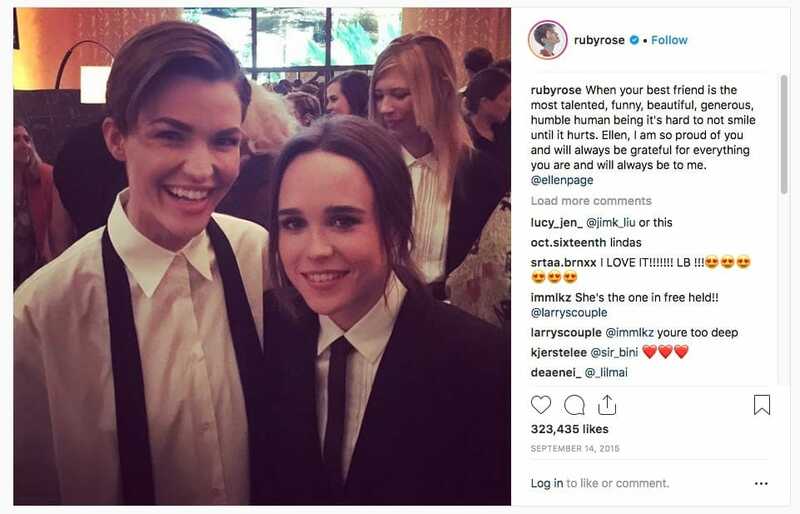 Ruby Rose and Ellen Page have been besties for a while, and have expressed that on multiple occasions. Being married to a comedian might not always be easy, but you have to learn that if they’re making fun of you, it’s really just an expression of love. Anyone who has seen the exchanges between television host and comedian Ellen DeGeneres, and her wife Portia, know that there is clearly so much love between them. When Ellen posted a video on Twitter making fun of her wife, it was just part of their usual banter. 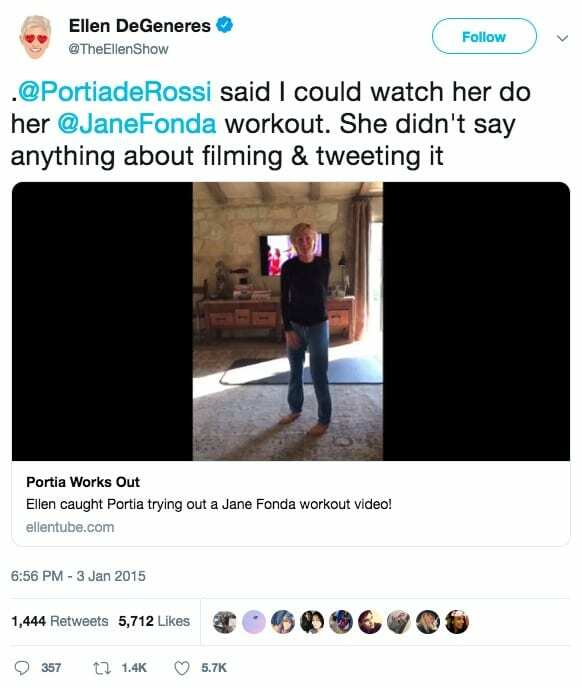 And Portia made sure to get Ellen back by sharing video of her own. Unless you’re familiar with British reality television, you might not know who Aaron Chalmers – but you’ll definitely know who Rita Ora is. Like many people around the world, Aaron seemed to develop a soft spot for the singer and decided to try his luck with social media flirting. Rather than messaging her directly, he decided to indirectly tell her that she is “crazy pretty” on his own profile. We can’t confirm or deny this, but we don’t think it worked. Sorry, Aaron. Better luck next time! 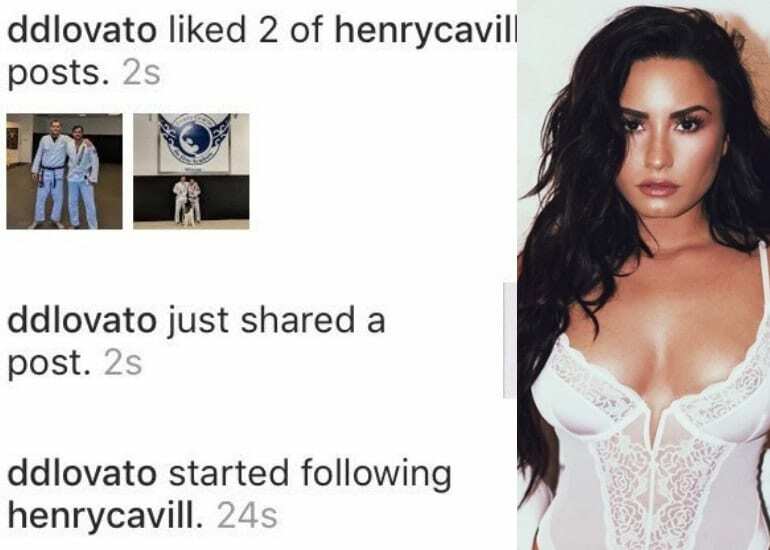 Demi Lovato decided to utilize the best tricks in the social media flirtation book. After realizing that Henry Cavill is one of the most handsome men in the world, she decided that she wanted to entice our favorite Superman. So, she followed him on Instagram, she liked a couple of his photos, and then she decided to update her own social media feed just in case he followed her back. Rather than posting a photo of her brunch, she uploaded a saucy lingerie selfie. He obviously did follow her back after that. 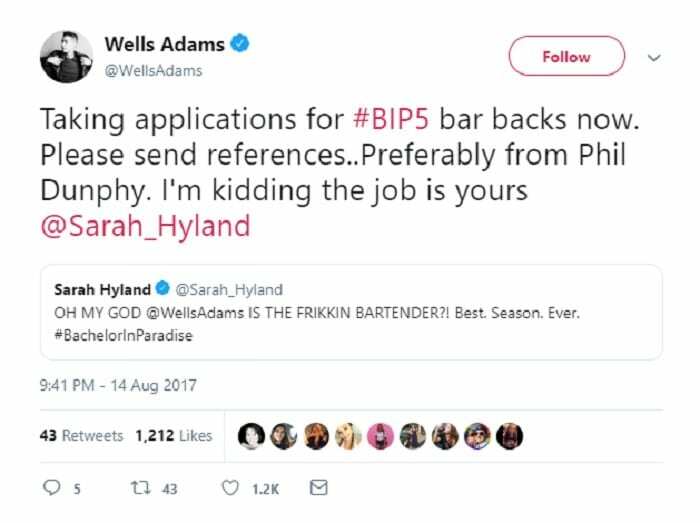 If you keep up with Sarah Hyland on social media, you’ll know that she has a place reserved in her heart for The Bachelor and The Bachelorette. While you might also have this same space, there’s a reason why she loves it so much. After watching Adam Wells make his way onto her screen, she just couldn’t contain her attraction to him. Thankfully, she decided to tag the bachelor, and they soon embarked on a Twitter flirtation. They’ve been together ever since, and it’s a modern-day love story we can all get behind. 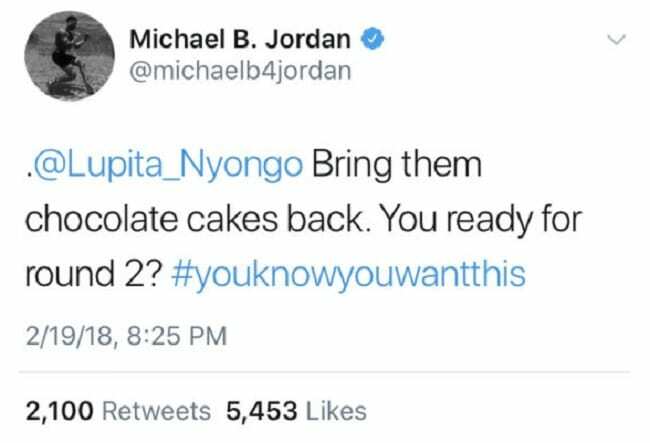 Every single day, Black Panther fans beg Michael B. Jordan and Lupita Nyong’o to take their friendship to the next level. This isn’t just because they would be the most attractive couple on the planet, but because they actually seem to get on quite well. And by “quite” we mean “flirting intently via the internet.” After Lupita dared Michael to take on a push-up challenge while on set, Michael wasn’t too happy with his loss. He wanted her to come back for “round 2.” Is it just us, or is it getting hot in here? 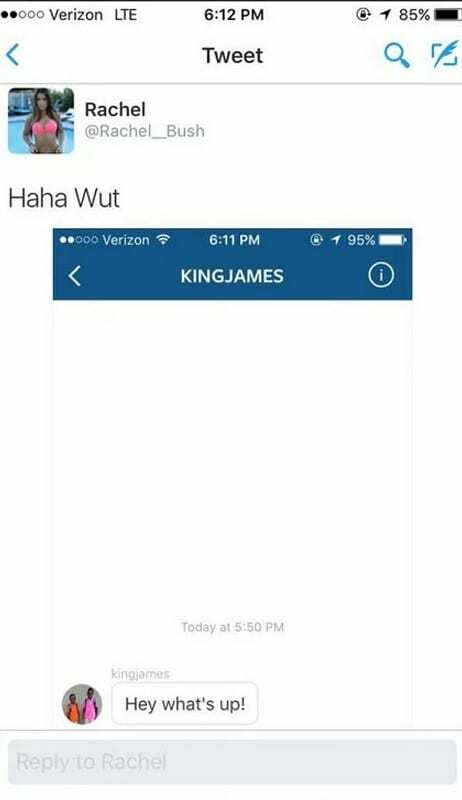 LeBron James is one of the most famous basketball players in the world, so we can imagine that Rachel Bush was pretty darn shocked when she received this message. The Instagram model immediately got her story out there and even called the Billy Madison Show with this flirtation. While she acknowledges the fact that LeBron not only has a wife but also has kids, she also acknowledges the fact that it may not have been LeBron himself who sent the message. After all, many celebs have staff to look after their social media accounts. Is there a celebrity that you really, really fancy? Well, you might not want to give up just yet, because Danielle Caesar didn’t. 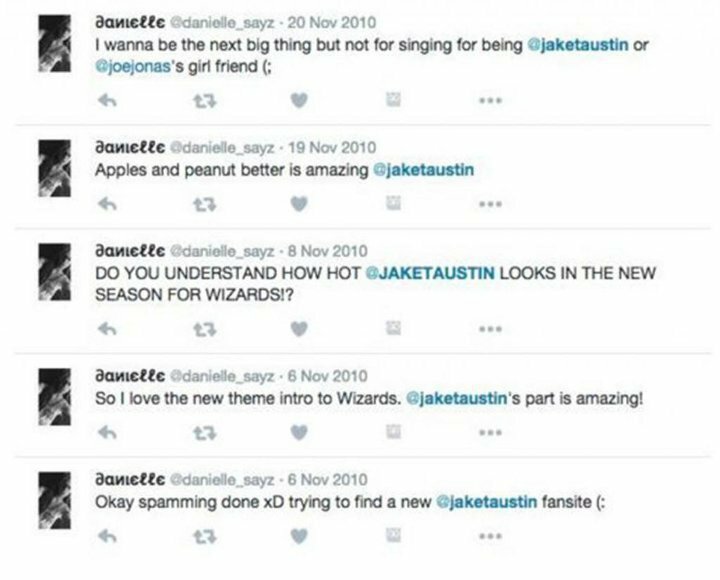 After watching Jake T. Austin in Wizards of Waverly Place, Danielle knew that she wanted to be with the actor. She tweeted him no less than 100 times over the space of five years and even noted that she would marry him – but it didn’t put him off. In fact, he thought it was cute and decided to give her a chance. They have been dating now since 2016, and that’s truly magical. Nick Young and Iggy Azalea seemed to be a match made in heaven before they called off their engagement, so we often like to go back to the good ol’ days where they were in their honeymoon period. Before they officially got together, Nick made no secret of the fact that he thought Iggy was pretty darn cool. He constantly made her his #WCW, and he even did so just a few days before they made their relationship official. He wasn’t scared of public displays of flirtation. No, sir. Andre Drummond and Jennette McCurdy are the #TBT couple we all like to remember because these guys really were the cutest. What was even more adorable, though, is just how much Andre liked the iCarly star before they got together. He would regularly post photographs on the actress on his own social media feeds, and eventually, she just couldn’t ignore his plights. She later sent him a tweet and realized that they much more in common than they first thought. They soon made things official, and our hearts burst with love. 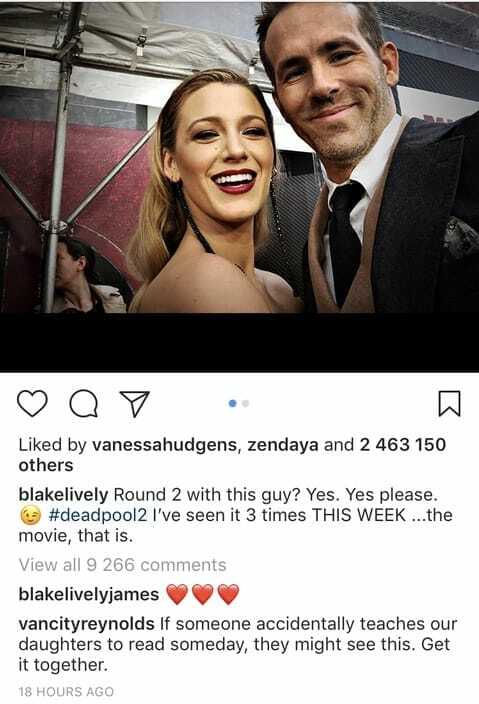 Let’s be honest; Blake Lively and Ryan Reynolds are the coolest couple in Hollywood. They are not only incredibly beautiful, but they also have the perfect family, and the most ridiculous senses of humor known to man or superhero. 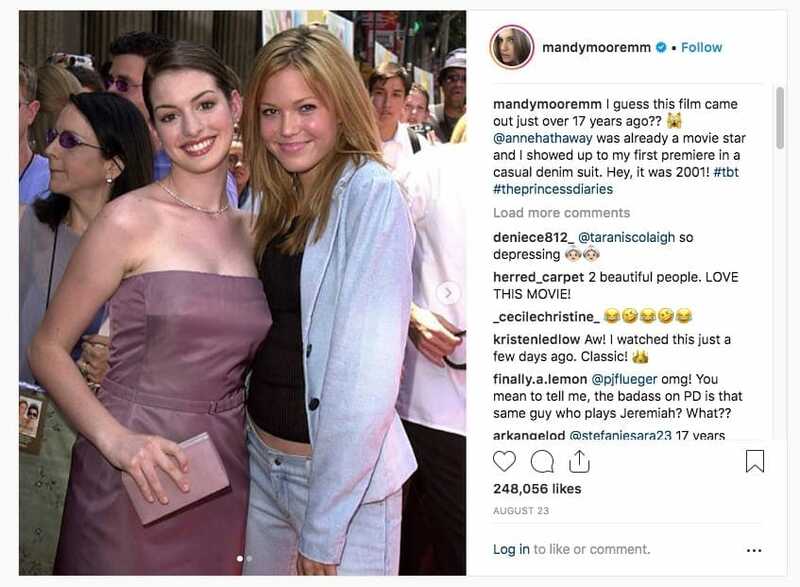 These two are known for roasting each other on social media, but sometimes we just can’t help but spot the flirty undertones in these comments. After all, Blake was definitely hinting towards something else here. The winky emoji says it all because we all know the wink emoji is flirting 101. In 2017, a woman by the name of Jessica Gober grabbed her five minutes of fame after her Tweet went viral. In this post, she noted that Justin Bieber had got into contact with the gym she worked at. Why? Well, he had seen a picture of Jessica on one of their photos, and it seems as though he really, really liked the look of her. He even plucked up the courage to message the gym to ask who she was! Jessica was not impressed, as she already had her own baby, baby, baby, ooh. Our hearts broke a little when Pete Davidson and Ariana Grande ended their engagement after a whirlwind romance. Although we were mostly worried about who would get custody of their pig, we also decided to cheer ourselves up with their former flirtations. 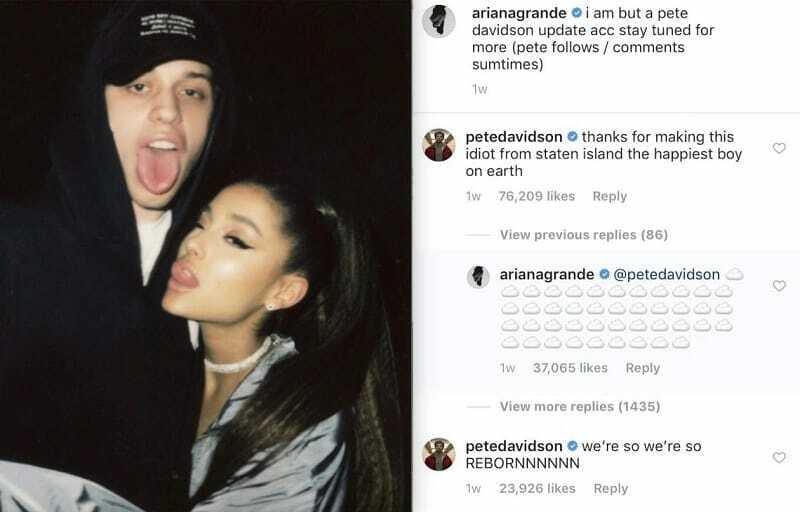 Ariana and Pete were not shy about their relationship on social media, and they were constantly laughing and joking with their comments under each other’s photos. As well as being the most adorable photo ever, these are also the most adorable flirty comments ever. 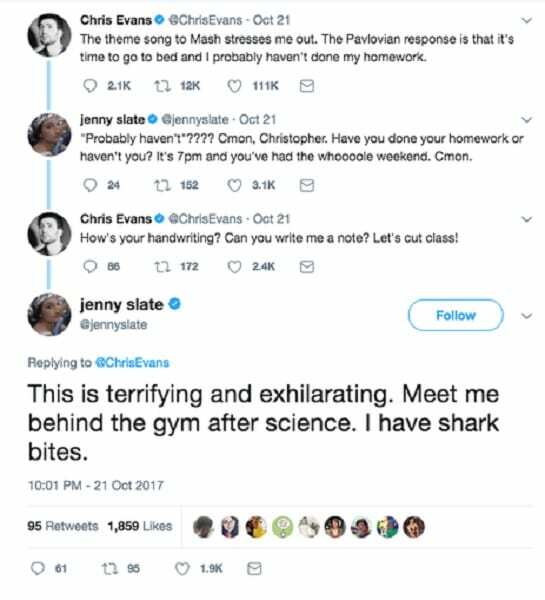 Chris Evans and Jenny Slate may have now broken up for the second time, but that doesn’t mean their flirtation hasn’t been completely real. In 2017, these two former lovebirds made us feel like teenagers again with their Twitter exchange – and we were happy to watch the whole thing unfold before our very eyes. As if this flirtation wasn’t enough to entice Chris into Jenny’s arms, she then threw in the deal breaker. She had Shark Bites. How could he say no? Well, he didn’t. 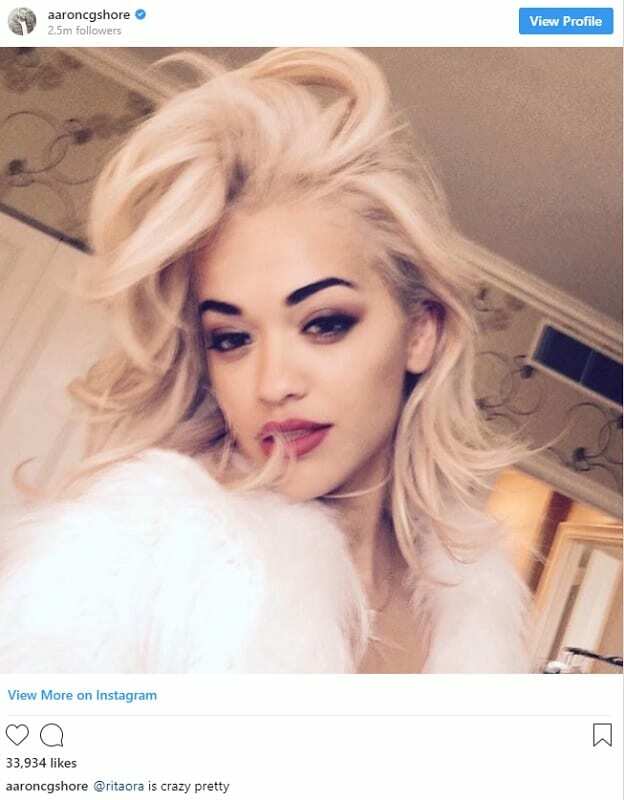 Rita Ora has been on the receiving end of flirty messages, but she has also given them herself. 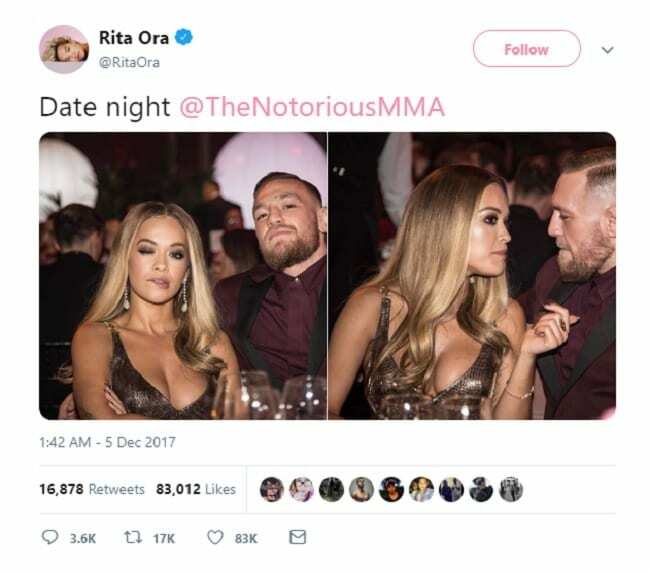 While this wouldn’t normally be an issue, when Rita posted this photograph of her getting up close and personal with Conor McGregor on their “date night,” some people weren’t too pleased. Most notably, her boyfriend and his wife weren’t too pleased. Rita later tried to backtrack on this comment and even changed the caption, but the damage was done. The flirtation had been spotted, and there was no going back. She’s on the list again. 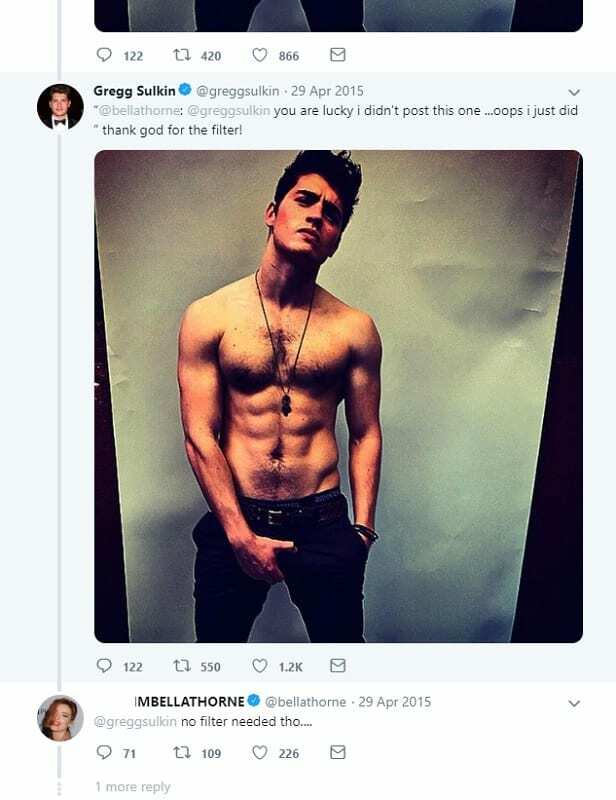 Bella Thorne has no chill when it comes to her celebrity crushes, and she’s not afraid to put her feelings out there for everyone to screenshot. Just one month before they made their relationship official, Bella decided to show off how she really felt about Gregg and his assets. While he was ready and willing to thank Instagram for allowing him to filter this saucy shot, Bella decided to say what many people around the world were thinking. Her flirtation seemed to work, as they dated for just over a year. 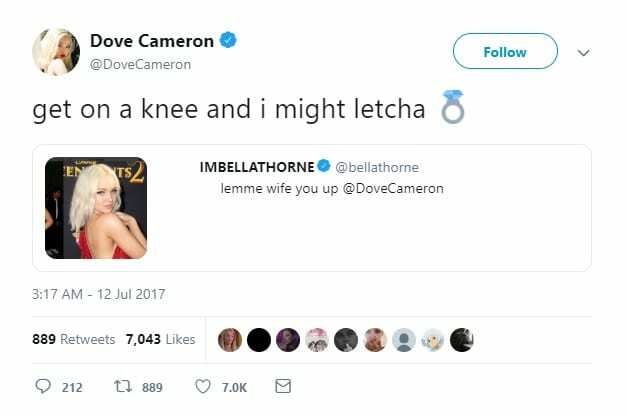 Dove Cameron is not short of admirers in the world of Hollywood, as Bella Thorne isn’t the only one who has wanted to put a ring on it. However, Thomas Doherty overtook Bella in the flirting fight, as he and Dove have now been dating since 2016! Before they officially got together, though, they were all about their PDA flirting on social media. After posting this totally and 100% “candid” photo, Thomas just had to call her out on it. Do you need some more light in that shade, Dove? Although it hasn’t been confirmed, The Greatest Showman fans are going pretty wild at the thought that Phillip Carlyle and Jenny Lind may be dating IRL. Yes, Zac and Rebecca have been spotted getting pretty cozy with each other since filming the movie together – and that’s before we even mention Zac’s Instagram posts. He has posted numerous photos with Rebecca by his side, but it was this one that got us all talking. 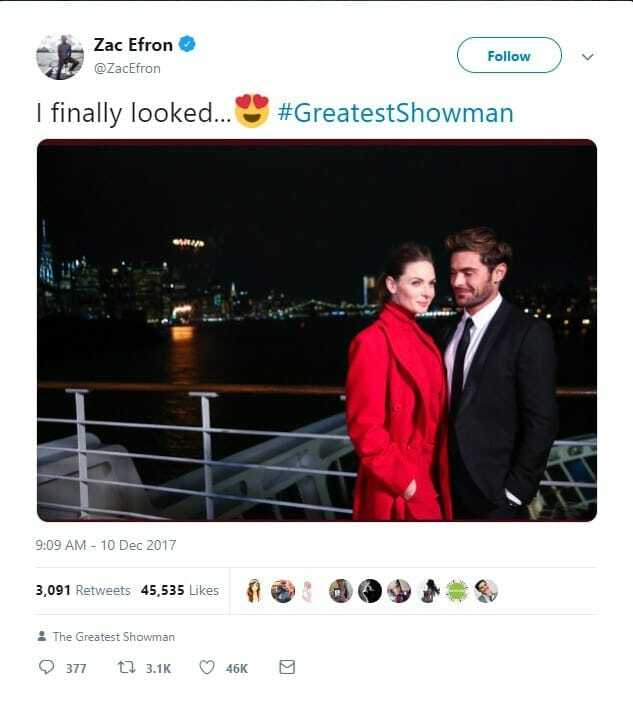 You looked, Zac? You posted a heart eyes emoji? You look adorable together? When’s the wedding? 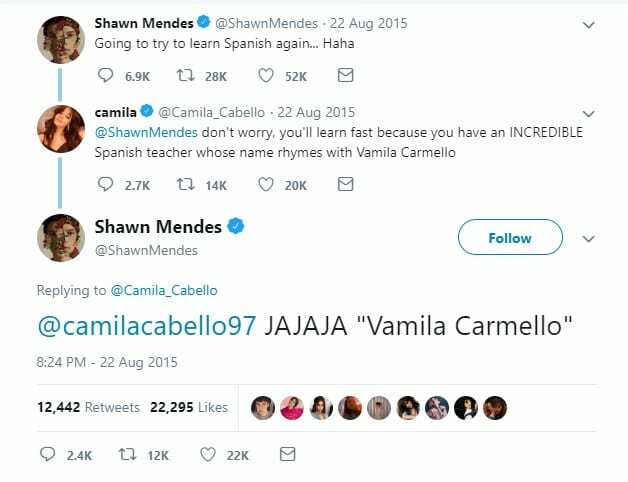 There are many shippers around the world who really want to make Camila and Shawn happen – and for a while there, it seemed as though it might! Over the past few years, these besties have allowed fans to think that there’s something more than friendship between them. They have had countless social media flirtations during their time in the limelight, but this one is perhaps one of our favorites. You can tell by the likes on these posts that Shawmila fans weren’t sad about it either. We don’t blame them. 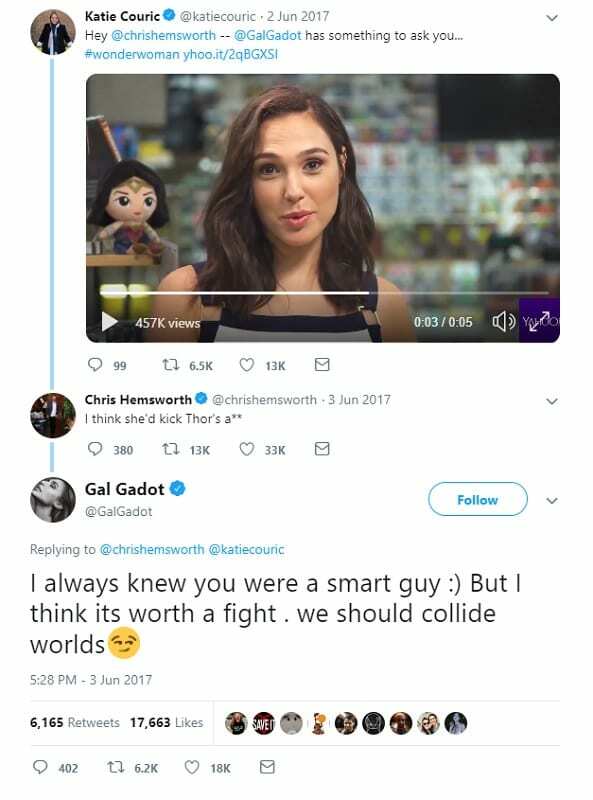 Although we know that Gal Gadot and Chris Hemsworth are in loving and committed relationships, we love the fact that they had bit of flirty banter (or flanter, if you will) with their Marvel and DC characters on social media. After Wonder Woman asked Thor who he thought would win in a fight, he correctly chose the Amazonian warrior. Then, Gal responded with a tweet that included something we all know to be flirting terminology: the suggestive smirk emoji. Could we see a Wonder Woman/Thor crossover? We have our fingers crossed.